MSRP (CAD): $6,981.38 *** Please contact us for corporate pricing or login to see web pricing or US$ pricing. 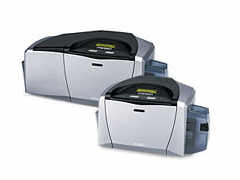 The Fargo DTC400 Card Printer/Encoder is designed for easy operation and hassle-free maintenance. The SmartLoad Ribbon Cartridge combines a printer ribbon and card cleaning roller into one disposable unit. Just slide in the cartridge, close the door, and you are done. No feeding or tearing ribbon rolls, no fumbling with separate cleaning rollers. The Fargo DTC400 Card Printer/Encoder is the ideal choice for mid-sized corporate, K-12 education and local/stategovernment. 44240 YMCKOK CARTRIDGE W/CLEANING ROLLER YMCKOK Cartridge w/Cleaning Roller: Full-color ribbon with two resin black panels and clear overlay panel 200 images. HID GLOBAL, ACCESSORY, YMCKOK CARTRIDGE W/CLEANING ROLLER, FULL-COLOR RIBBON WITH TWO RESIN BLACK PANELS AND CLEAR OVERLAY PANEL, 200 IMAGES YMCKOK Cartridge (with Cleaning Roller Color Ribbon with 2Black Panel) "YMCKOK Cartridge with Cleaning Roller: Full-color Ribbon with Two Resin Black Panels and Clear Overlay Panel 200Images" """YMCKOK Cartridge with Cleaning Roller: Full-color Ribbon with Two Resin Black Panels and Clear Overlay Panel 200Images"""
81763 ULTRACARD III 30 MIL CARDS UltraCard III PVC/Polyester 30 mil cards. 500 Cards Pack. 81774001 1.0 MIL OVERLAMINATE, SMART CHIP, CLEAR PolyGuard 1.0 mil Overlaminate, with left side cutout for smart chip, Clear, 125count (Now compatible with DTC-LC and HDP-LC). 81784 POLYGUARD 1.0 MIL OVERLAMINATE, CLEAR PolyGuard 1.0 mil Overlaminate, Clear, 125 count. (Now compatible with DTC-LC and HDP-LC). 82123 LED FLUORESCENT UV LIGHT (KEY CHAIN) LED Fluorescent UV Light (Key Chain). For use with 6-panel fluorescing ribbon (P/N 44239). Available on Print Security Suite. 82126 1.0 MIL LAMINATE, SMART CHIP/FULL-PATCH PolyGuard 1.0 mil Overlaminate, alternating full-patch with smart chip cutout/full-patch, Clear, 150 count. (Now compatible with DTC-LC and HDP-LC). 85976 CLEANING KIT, SWABS, CARDS, PADS CLEANING KIT DTC300/400/PERSONA 30 CLEANING SWABS/GAUZE PADS/CARDS Cleaning Kit for DTC400E and C30E. Includes 4 Printhead Cleaning Swabs, 10 Cleaning Cards, 10 Gauze Cleaning Pads and instructions.